Contrary to what various terrified millionaires believed, New York's Citi Bike bike sharing program has not resulted in the city's wholesale destruction. But they are really slow when you ride them. This Kickstarter seeks to solve that problem. See, the Citi Bikes themselves are frustratingly slower than your average road bike. They're heavy and they only have three gears, so you won't exactly be flying through traffic when you rent one. So inventor Jeff Guida thinks he has a solution in the form of the ShareRoller, a device he's trying to fund through Kickstarter. Basically, it's a six pound portable 750 watt electric motor that can be installed on a bike in 10 seconds or less. Once it's on there, it can propel the bike without pedaling up to 18 mph. And with a variable throttle button, you can decide how much electric assistance you really want. Guida says the device will work on all major bike share bikes in the U.S., Canada and the UK, as well as on your own personal bike or scooter. It also has a USB port so you can charge your smartphone as well, and built-in LED lights. The inventor says that if they meet their Kickstarter goals, they can start delivering these devices and selling them to the public by late summer. Right now they've hit $16,500 of their $100,000 end-of-March goal, so they have a ways to go. 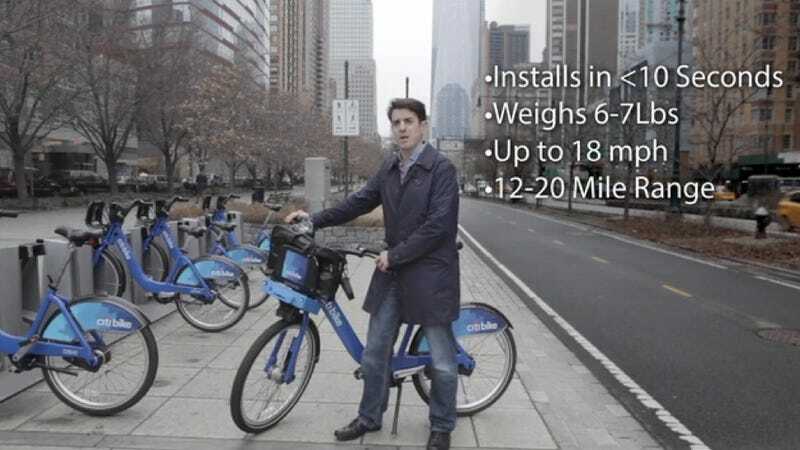 It sounds like a great idea to me, and one I'd actually use on the lethargic D.C. Bike Share bikes here in the District that I use on occasion. Of course, as Gothamist points out today, New York bans electric-assisted bicycles, but they say Guida hopes to skirt that law by making riders pedal for the bike to start moving.